This free method produces a bare-bones slideshow, with no control over slide duration, transitions, captions or music (though you could always use iTunes to play music in the background). In the Finder, select the files you want to view—Command-A to select all the pictures in an open folder, of course, and Command-Shift to select consecutive or Command-click to select nonconsecutives. You can also drag within a Finder window to select multiple photos (start your drag to the left or right of the filenames). Next, press the space bar to enlarge the first photo and then enter full screen mode by clicking the double arrow icon at the upper right of the resulting window (circled). In the dark toolbar that appears, click the Play button or use your arrow keys to move to and fro throughout the show. Quick Look lets you assemble a slideshow at warp speed. To exit the slideshow, wiggle your mouse to reveal this toolbar and click the circled X (or tap your keyboard’s Esc key twice). Like QuickView, you can’t customize a Preview slideshow but it gets the job done fast (and free). Launch Preview and choose File > Open. In the resulting dialog box, select multiple photos, or a folder of photos, and click Open (you can also drag a folder or files onto the Preview icon in your Dock or Applications folder). Once the images open in a single document, choose View > Slideshow or press Shift-Command-F; the slideshow automatically plays. The controls you get in a Preview slideshow are nearly identical to those in QuickView. Click the circled X or tap your keyboard’s Esc key once to end the show. iPhoto’s slideshows offer a wide variety of control over theme (visual animation style), slide duration, music, transitions, captions, and much more. To begin, select some photos in iPhoto, or better yet, select an album, since that lets you control the order of your pictures. For an instant slideshow, click the Slideshow button in iPhoto’s toolbar and in the resulting panel, pick a theme, adjust music, and so on. Click Play to see the show and wiggle your mouse to summon an onscreen control bar. In Faces view, you can kick off an instant slideshow by Control-clicking a Faces album and choosing Play Slideshow from the shortcut menu. 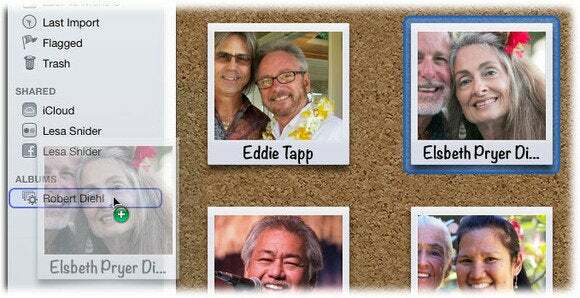 For an instant slideshow of multiple Faces albums (great for anniversary parties), drag a Faces album into an empty area of your Source list to create a smart album. Next, drag another Faces album onto that same smart album and then use the Control-click technique to start the show. 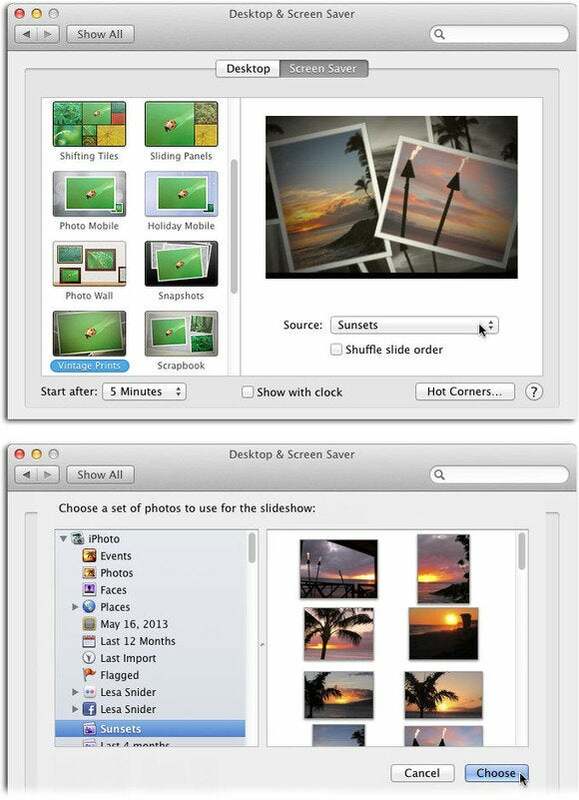 In contrast, you can create a saved slideshow by selecting an album or multiple photos and choosing File> New Slideshow. Saved slideshows appear as clickable icons in your Source list, so you can tweak them to death now or later—you can even set different transition and speed settings for each slide. Saved slideshows can be synced to iOS devices by using iPhoto to export them as a QuickTime movie, connecting your iOS device to your Mac, and then turning on “Include Videos” in iTunes’ Photos tab before syncing (see the Apple TV entry below for more). From the Apple menu on your Mac, choose System Preferences and click the Desktop & Screen Saver icon. In the resulting window, click the Screen Saver tab, and then click one of the 14 photo-based themes in the left-hand list. When you do, a Source menu appears beneath the theme’s preview; choose Photo Library (it’ll take a minute to populate this menu) and a new pane appears at left listing your iPhoto goodies. Click an album to see what photos are inside and then click Choose. Back in the Desktop & Screen Saver window, you see a mini version of your new screensaver playing on the right. The benefit of the Screensaver method is that if you have dual monitors, some themes (such as Vintage Prints) generate different slides for each monitor. You can also activate the show instantly by using Hot Corners; click the Hot Corners button, set one of the menus to Start Screensaver, then whenever you mouse into that corner of your screen, the show plays. If you own an Apple TV, you can use it to parade your photos on your TV in a mind-blowing manner. If you’ve got an iCloud account, sign into it on your Apple TV, and choose iCloud Photos or Photo Stream from the main menu. If you’re rolling sans iCloud, fire up iTunes on your Mac and choose File> Home Sharing > Turn On Home Sharing (for iTunes 10.7 and earlier, choose Advanced > Turn On Home Sharing). Enter your Apple ID and password, choose File > Home Sharing > Choose Photos to Share with Apple TV. The iTunes window changes to display a list of your albums, Events, and Faces albums. Make sure the “Share Photos from” checkbox is turned on, and then use the controls to share your photos—from iPhoto or those stashed in a folder on your hard drive. Turn on “Include videos” to include any iPhoto slideshows you’ve exported, and then click Apply. On the Apple TV, choose Settings > Computers > Turn On Home Sharing. Enter your Apple ID, and in the iTunes libraries shown (which could be from multiple Macs), pick what you want to see; as long as the Mac containing the shared library is turned on and iTunes is running, you’re golden. With an iOS device and an AppleTV on the same wireless network, you’re set to awe others by projecting your iOS device’s display onto your TV. First, grab your iOS device and swipe upward from the bottom of your screen. Tap the AirPlay icon (circled) and from the resulting list, tap the Apple TV you want to project to, turn on Mirroring, and tap Done. 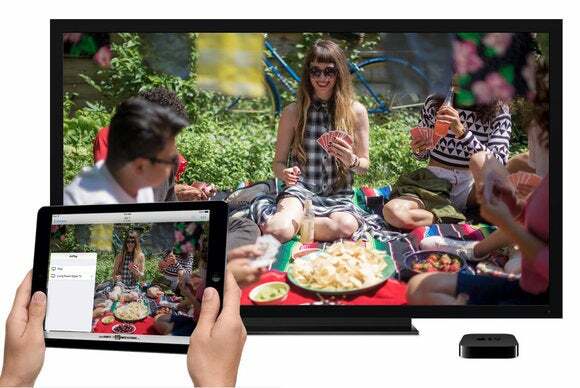 Now your iOS device’s screen appears on your TV. To play a slideshow, launch the Photos app, tap an album and, on an iPad, tap the Slideshow button that appears at upper right. On an iPhone, tap a photo in the album and then tap the share icon at lower left. Next, tap the Slideshow button that appears at the bottom (circled) and then choose a display device from the next screen. Click Start Slideshow to watch all the photos in the album play. 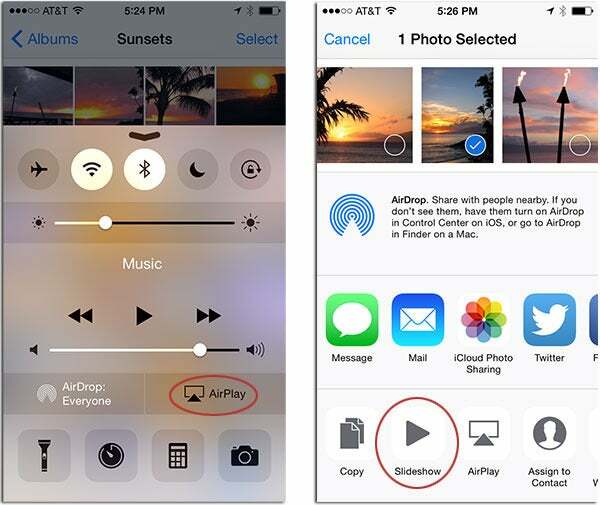 Left: You can access AirPlay by swiping up from the bottom of your iOS device. Right: Oddly, selecting a single photo in an album on an iPhone and then clicking Slideshow makes the whole album play. Of course, other options include using iMovie ($16), Keynote ($20; though the useful SmartBuild feature was stripped from version 6), and other third-party tools. If you own more advanced image editing software such as Adobe Photoshop (using the Automate > PDF Presentation command), Photoshop Elements (using the Organizer), Bridge (using the View > Slideshow command), and Lightroom (using its pro-level Slideshow module), you can create slick slideshows, too. 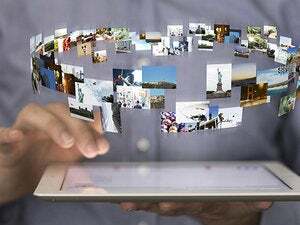 And once your slideshow is exported into QuickTime or PDF format, you can use iTunes file sharing to port a full-resolution version onto your iOS device. As you can see, there are many ways to show off your pictures, though perhaps the hardest part is remembering to do it! Until next time, may the creative force be with you all. PhotoLesa founder Lesa Snider teaches the world to create better graphics. She’s the author of the best-selling Photoshop: The Missing Manual books, coauthor of iPhoto: The Missing Manual, author of The Skinny Book ebook series, a founding creativeLIVE instructor, and regular columnist for Photoshop User and Photo Elements Techniques magazines.